The Satin Smooth Waxing Starter Kit is created for those of you who want to save some time and money when it comes to hair removal. You won't have to go to the spa/salon on your day off, just remove the unwanted hair yourself in the comfort of your own home. Waxing is a fast and effective form of hair removal that will leave your skin smooth and hair free for weeks. This kit has everything you need to get started from the wax itself to the cleansing oil that will remover the wax after application. It is very important when waxing to do it properly, as it can be more painful and not remove the hair if not done right. With cotton apply the pre wax cleanser, just make sure to rub off any excess cleanser before applying the wax. Then with an applicator stick apply the warm wax in the same direction as hair growth. If this is your first time waxing do a small area at a time. Apply the muslin strip on top of the wax, rubbing it on, make sure to leave a little muslin free of wax to hold. Then with the free end quickly pull back against the hair growth. Try not to go over the same spot more than once, it will just cause more irritation to the skin. Then when hair free use the post wax oil to remove any sticky excess and the aloe lotion after to soothe the skin. If you have never waxed before try the legs first, as in my opinion it is the easiest and least sensitive part of the body. The Satin Smooth starter waxing kit is very well rated among most users who say it is quick and easy to use and is less painful than other at home wax kits. Some do find it a little messy but it gets less as you get better. One users found it too harsh for her skin, it left her with red irritated skin that wasn't completely hair free. This will happen if not used properly! At $49.99 (usually 59.95) for the kit it is a great deal and works out a lot cheaper than going to the salon, according to users. Anything designed to help get rid of calluses is great in my eyes. I get it on the balls of my feet and if left untreated it can get painful. I use a foot file everyday in the shower which helps but doesn't get rid of it! The Unscented Callus Eliminator by Be Natural is devised to break down the callus in as little as 3-5 minutes, then you should be able to file or buff it away. This solution contains Potassium Hydroxide which has been define caustic. A caustic means some thing that is capable of burning, corroding, dissolving, or eating away by chemical action. This is the main ingredients used in this formula, so theoretically it should work if the other chemicals mix well with it. Purified Water, Potassium Hydroxide, Propylene Glycol, Glycerin, Acrylates/C10-30 Alkyl Acrylate Crosspolymer, Sodium Hydroxymethylglycinate, Disodium EDTA. 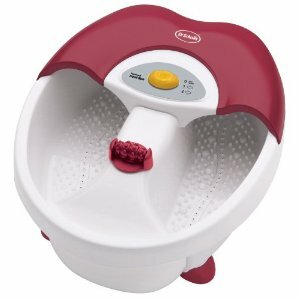 Soak feet then spread a generous amount of Callus Eliminator over callus. Let it set for 3-5 minutes depending on callus buildup. Then, wipe away excess and use a file or buffer to gently remove callus. Wash off with water. Wear gloves while applying to callus as some users found it caused a burning feeling on their hands. 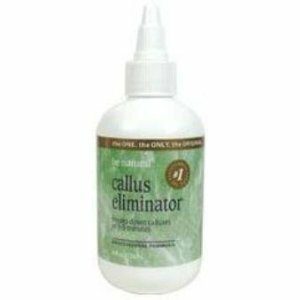 Most of the people who used the Callus Eliminator found it worked very well after just one use but they did say that the instructions must be followed correctly for it to work effectively. However, there are a few people who found it didn't help with the removal of their calluses. A lot of users also recommend using gloves when applying the solution as it may cause burning on your hands. Some think it is over priced at $16.25 but it works for most patrons and lasts a long time so I think it is worth the price. Miracle Foot Repair cream with Aloe is devised to relieve dry, cracked, itchy feet and heels as well as rid your feet of unpleasant odors. This cream contains 60% pure Aloe Vera gel from the leaf of the plant and the rest is made up of moisturizers to helps soften skin so the cream can penetrate deep into the skins layers, allowing the aloe to help speed up cell renewal reducing cracks and dryness. The cream comes in a white 4oz tube with a screw on cap. You can use as much or little of the cream and rub it onto the effected area. It is also safe for diabetics to use. Vitamin C which helps maintain tone of blood vessels and promotes good circulation and is essential to the health of the adrenal gland which supports our body in times of stress. Amino acids which are chains of atoms constructing protein in our body. Enzymes, which are the life-principle in every live, organic atom and molecule of natural raw food, rejuvenate aged tissues and promote healthy skin. Germanium which is a mineral that some health authorities claim therapeutic benefits for: immunodeficiency, pain, cardiac disorders, circulatory disturbances and eye problems. Active Ingredients: Menthol; Inactive Ingredients: Aloe Vera Gel (60%) (UltraAloe-Plus Process), Water, Stearic Acid, Glyceryl Stearate, PEG 100 Stearate, Mineral Oil, Emulsifying Wax NF, Propylene Glycol, Hydrogenated Polyisobutene, Cetyl Alcohol, Dimethicone, Triethanolamine, Salicylic Acid, Imidazolidinyl Urea, Carrageenan, Methylparaben, Propylparaben, Tolnaftate, Peppermint Oil, Chloroxylenol. 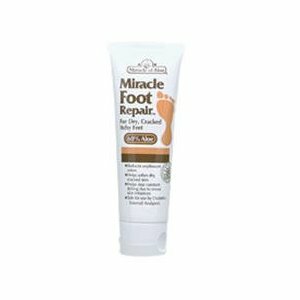 The patrons that use this foot cream cherish the way it leaves their feet feeling smooth and itch free. Most also like the peppermint scent, although there are a few who find it too strong but they say it wears off shortly after application. One lady said she couldn't understand how the reviews were so good when it didn't work at all for her cracked heels. At $9.99 a tube it could definitely be worth a try. 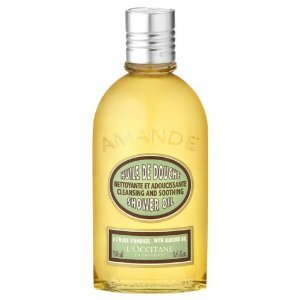 L'occitane Almond Shower Oil is a unique oil that transforms into a bountiful foam, unlike other shower and body oils. It is designed to leave the skin feeling like it has a satin like softness without it being left with that awful greasy film. The shower oil does contain grape seed oil which can be irritating to sensitive skin and can also cause staining on linens if not washed off thoroughly. Mipa-Laureth Sulfate, Vitis Vinifera (Grape) Seed Oil, Laureth-3, Caprylic/Capric Triglyceride, Prunus Amygdalus Dulcis (Sweet Almond) Oil, Sorbitan Oleate, Peg-7 Glyceryl Cocoate, Fragrance, Cocamide Mea, Propylene Glycol, Tocopherol, Limonene, Coumarin, Rosmarinus Officinalis (Rosemary) Leaf Extract, Helianthus Annuus (Sunflower) Seed Oil, Linalool. Apply a dime sized amount onto a wash cloth and lather, apply all over body, then rinse. Most patrons using the Almond shower oil found it made their skin very soft and they also cherish the almond aroma. However some users do think it is lavishly priced at $22 for a 8.4oz bottle. While others think it is worth the price as it leave the skin so luxuriously soft. Wen has devised this Fig oil to be used on hair, body and in the bath it should provide moisturize for the body and hair as well as adding softness and shine to help them look healthier for longer. It is made up of essential oils that leave the body and hair with a delightful aroma, says Wen. Also suggested by Wen is for you to add the oil to your body lotion or leave in conditioner for that extra bit of moisture. The oil itself comes in a brown glass bottle with a rubber drop applicator lid, allowing for more exact oil usage. If you know much about aromatherapy, it's one of those bottles. Cold-Pressed Golden Jojoba and Essential Oils. Bath: Apply 2-4 full droppers into bath water. Body: Apply 1-2 full droppers to skin after showering, before drying off. Hair: Apply 3-5 full droppers to dry hair before bed. Tilt head back and apply directly to scalp, massage vigorously, brush through, and leave-in overnight. Cleanse out with the Cleansing Conditioners the following morning. Recommended at least 2-3 times per week for scalp treatment. This body and hair oil by Wen has very good reviews from the users, who say it moisturizes dry hair, softens the skin and smells fabulous. There are a couple of fans that think the fragrance is too strong but they say it doesn't last, so it's not unbearable. One lady found it didn't work at all for her dry hair and said it is a waste of money. At $20 for a 4oz bottle I think it is a average price considering it lasts a long time. 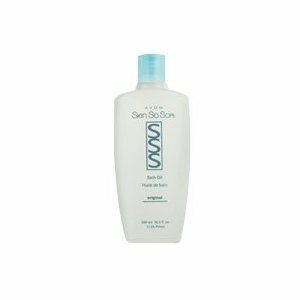 Skin So Soft bath oil by Avon was created to be added to the tub to leave skin smooth, soft and lock in that much needed moisture. Avon says the formula is unique with its all over moisturizing and the original woodland fragrance. It doesn't seem very unique to me as its main ingredients are mineral oil, carrot seed oil and BHT. I just want to give you a little info into the background of BHT. It is a crystalline phenolic antioxidant used to preserve fats and oils, especially in foods. BHT was banned by the FDA in use of baby foods and is also banned in all foods in the U.K. It is still widely used in other foods and cosmetics around the world. Many scientists have tested BHT and say it's a carcinogen. This means they believe it causes cancer. Although there are others who believe it actually prevents cancer. Even then the results aren't that rosy, as in some instances they found it can still cause enlarged liver tumors. These tests use a significant amount of BHT over a prolonged period, some scientific evidence shows that small amounts in cosmetics are safe to use. Sorry if this scares you but I think you should know about the ingredients your using. MINERAL OIL/HUILE MINERALE, ISOPROPYL PALMITATE, DICAPRYL ADIPATE, PARFUM/FRAGRANCE, DIOCTYL SODIUM SULFOSUCCINATE, BHT, DAUCUS CAROTA SATIVA (CARROT) SEED OIL. It seems that Skin So Soft can be used for many tasks, according to a lot of patrons that say they use it for such tasks as an insect repellant, cut oil grease, moisturize skin etc. However, some users think it is too greasy no matter how little you use. I would like to point out that as it it made from mineral oil and carrot seed oil that it will be greasy. It would be better for people with very dry skin as most of the oil should be absorbed into the skin. A few Patrons think it is priced quite high at $16 for a 24fl.oz bottle. I think it's a reasonable price for a multi-use formula. Just be aware that it does contain a small amount of cancer causing BHT. 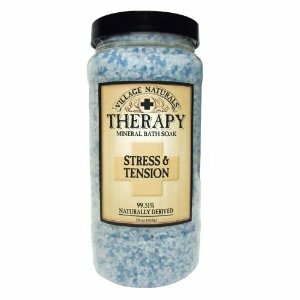 Village Naturals Therapy Mineral Bath Soak has a therapeutic formula containing vitamins and aromatherapy vapors. This mix of ingredients help soften skin as well as relieve stress and tension in the body and mind. 99.51% of the ingredients in the bath salts are derived from natural sources, which I know will make this product more appealing to those of you that prefer to keep it natural. You will also be glad to know that Village naturals don't test on animals nor are any of the ingredients obtained from animals. Place 2 hand fulls of salts into the warm water while the bath is running. These bath salts seemed to have made a good impression on most of the people using it. They think the salts smell clean and fresh, help relax and are good value for money at $6.95 for a 20oz jar. However, there are a couple of users that think the bath salts should come in a bigger container, so they will last longer. One lady said the salts left a stained ring on her tub that is hard to remove. It's great to have a body scrub that also helps to reduce acne breakouts, I hate it when summer comes and you don't feel comfortable wearing that strappy top because of a breakout on the back. 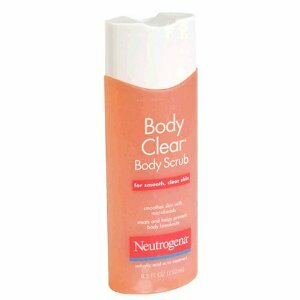 Neutrogena Body Clear Body Scrub is formulated with salicylic acid is a proven ingredient to help clear acne and reduce further breakouts. The scrub also contains micro-beads to get rid of dead skin cells that can clog pores therefor leaving the skin smoother and clearer. This body scrub is gentle as it only contains 2% salicylic acid and Neutrogena also promises that the lather will rinse off easily without leaving any pore clogging residue behind. It is designed for daily use in the shower or bath. Salicylic Acid (2%) (Acne Treatment)Water, Sodium C14 16 Olefin Sulfonate, Cocamidopropyl Betaine, Disodium Cocamphodiacetate, Polyethylene, Glycerin, Acrylates/Aminoacrylates/C10 30 Alkyl PEG 20 Itaconate Copolymer, Sodium Methyl Cocoyl Taurate, Linoleamidopropyl PG Dimonium Chloride Phosphate, Matricaria Flower Extract (Chamomilla Recutita), Citric Acid, Propylene Glycol, Butylene Glycol, Camellia Sinensis Leaf Extract, Yellow 6, Red 40, Blue 1 Lake (CI 42090), Red 33, Yellow 5, Fragrance. All in all a reasonable product from Neutrogena with most of the users singing its praises. They said it helped clear acne as well as smooth their skin. However, there area couple of patrons that found the formula didn't work at all for their acne breakouts and in some cases it just dried and irritated it. At $23.97 for 3 8.5oz bottles it is quite reasonably priced and won't break the bank if you want to give it a try. I think most woman have the annoying sometimes unsightly and painful cracked heels, especially during the summer months when wearing sandals, flip flops etc. Heel Tastic Intensive Heel Therapy promises to banish dry cracked heels with a swipe of its roll on balm. The roll on is designed to make for a quick and easy application with no mess. The balm itself has a pleasant lemony scent and is gentle enough to use as often as needed. This formula contains anti-fungal and anti-bacterial oils, as well as skin moisturizers, and special nutrients specifically formulated for promoting healthy skin. Heel Tastic seems to have made a good impression on most users as they say its fabulous for curing dry cracked heels and they also admire the natural ingredients used to make it. Some of the users dislike the herbal lemony smell with others adore it. The balm does make your feet slippery according to users, although they don't think its a big problem and just wear socks after application. It is good value for money at $11 for a 5" tube and lasts a long time. You are currently browsing the BeautyNib blog archives for October, 2010.